Earlier this week, our buddies over at Standard and Poor’s (S&P) re-affirmed its sovereign-debt rating of AA- for Japan and maintained its negative outlook for the economy. There were a few worrywarts who braced for a downgrade. However, the agency kept its rating in line with the two other major rating agencies, Moody’s and Fitch, who have ranked Japanese debt at Aa3 and AA-, respectively. There were a couple of reasons which S&P pointed out why Japan shouldn’t be stripped of its AA- grade. In its statement, it said that the country’s rating was supported by a strong currency reserve position and consistent current account surpluses. Japan currently holds over 1 trillion USD worth of foreign currency reserves, making it the second biggest holder of reserves next to China. Take note, having a lot of foreign currency reserves can be a useful tool in enforcing economic policy, as it can be used to implement monetary policy and to facilitate trade. Moreover, Japan has continued to post positive current account surpluses, indicating that it is still a major player in international trade. It also means that it has a continuous flow of international funds going in and out of the country. But sadly, it isn’t all good for Japan. Analysts point out the country’s massive debt, the highest among industrialized nations, now totals to 200% of its GDP. To put that into perspective, the infamous debt-ridden Greece has a smaller debt-to-GDP ratio of 160%. The only reason why markets aren’t so worried is that a bigger proportion of Greek debt is held by private investors who are more likely to sell the bonds than the big financial firms which hold most of Japan’s debt. Politics also stand in the way of Japan reeling in its deficit. The government has been trying to increase taxes to sustain social welfare expenses from its current level of 5% to 8% in 2014 and then to 10% in 2015. However, Japan’s main opposition party is committed to block the implementation of higher sales taxes. Yikes! And so, while S&P analysts let Japan keep its current rating, they warned that there is a 1 in 3 chance that the country could see another downgrade in the next couple of years. That’s even bigger odds than Cyclopip‘s odds of making our laser tag team (sorry bro, you’re just too big a target!). So what could happen if we see another downgrade? Well, it would surely be a pain in the neck for Japanese officials. We’d probably see bond yields rise as investors typically demand higher premium for lower-rated securities. This would be bad news because even at the current low rates of about 1% for 10-year bonds, payment is already estimated to eat up 24.3% of the 90.33 trillion JPY budget for this year. However, in this old man’s humble opinion, its effects won’t be that catastrophic. For one, credit rating agencies have been issuing downgrades left and right and Japan would only become just another one of their victims. 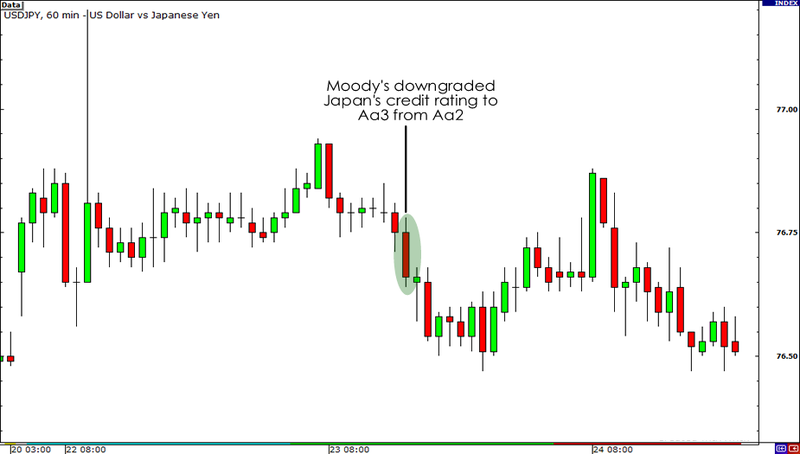 As for the yen, we’ll probably see the same muted reaction that we did in August 2011 when Moody’s downgraded Japan’s rating. Despite the move, USD/JPY still continued trading lower following the announcement. Then again, that’s just my opinion. What do you think would be the effect of another downgrade for Japan? What do you think would be the effect of another downgrade for Japan?